Pinetum Lodge is available for hire. The Lodge is the ideal location for magical family gatherings, to be tucked away for fun with a group of friends, or to provide an elegant setting for corporate meetings. The property can accommodate up to 11 people – not counting dogs who are very welcome. In Winter, enjoy open fires combined with an oil fuelled AGA and central heating for a cosy retreat. The property copes well with catering for large groups with a family kitchen and very large living room, ample seating, crockery, cutlery as well as space to escape from the crowd should you so wish! In summer, the gardens and surrounding woodlands really come to life and groups can also make use of the patio area and outdoor swimming pool (heated from May – October). The property can be hired for minimum 2 night stays or longer. Please contact by telephone to make arrangements initially, we will then confirm in writing by email. Prices will be discussed when we know numbers and dates. As this world we live in gets faster and allows us less and less time for ourselves, we sometimes need to step away from the pressures of everyday life. This tranquil oasis can give you that rare opportunity. The Pinetum is a private arboretum of spectacular trees and views over the rolling Cotswold landscape. Planted in 1840 by Thomas Gambier Parry and coaxed to its current beauty by David Wilkin and his wife, Carol, over the past 60 years. The Pinetum is more than a place to stay, it is a place that will stay with you. It is a space to breathe. As one guest commented: ‘This must be where the angels live’. 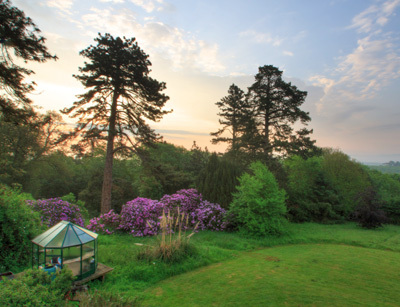 The Pinetum is an historic Victorian hunting lodge available for rent, well off the beaten track situated in 13 acres of beautiful woodland garden in the Gloucestershire countryside. Only four miles West of Gloucester, surrounded by a 500 acre RSPB reserve and high above the Severn Vale, it affords spectacular views across the valley to the rolling Cotswold hills. 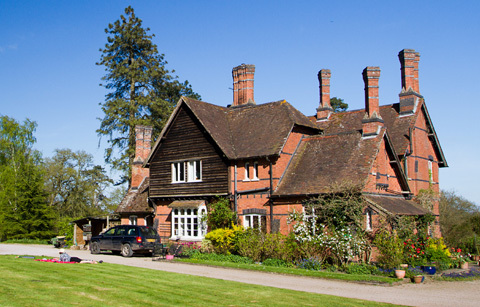 It is situated within easy reach of the Forest of Dean to the West, and Tewkesbury and Gloucester to the East. There are several woodland walks that start from the Lodge, as well as those within the neighbouring Highnam Wood. Guests can benefit from 5 bedrooms, a huge living room and kitchen, open fires and swimming pool. Dogs are welcome. Ideal for group and family breaks. 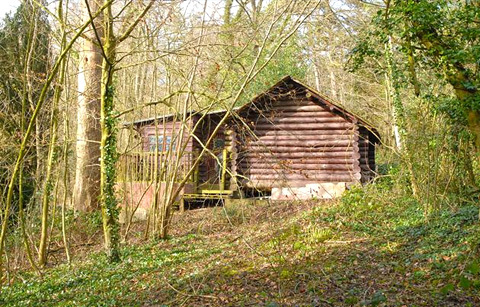 Surrounded by woodland, this accommodation is deceptively rustic from the outside but the modern interior features a flat screen tv, breakfast bar, fully functional kitchen and innovative bathroom with bath & rain shower neatly contained within. Sit on the deck and make use of the barbeque whilst enjoying the privacy and tranquility of the Pinetum and its wildlife in this cosy, romantic getaway spot. Lovely walks right from the very Lodge itself. Guests can follow paths constructed in 1840 and still edged to this day by the original slate – unearthed during renovations in the 1980s. Public footpaths surround the Pinetum allowing visitors to enjoy walks to suit their stamina. 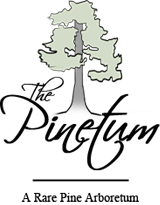 The Pinetum tree house which proudly sticks its head above the canopy was built ten years ago out of a desire to reach for the skies and provide a quiet venue for the writing of the Pinetum history. The book is still to be finished but the romantic house in the trees is an excellent venue for pre-dinner drinks. The Natural water Garden is now an established part of the Pinetum, over which a latticed pine bridge has been constructed.